The position of the fret on the fingerboard indicate the location of the next note, as a result, their positioning and the shape of their crown are crucial for good intonation. Guitars may require refretting for many reasons, the most obvious being to replace worn frets or change their size. However, refretting is also necessary when correcting neck issues that require planeing of the fingerboard. There are many choices available when it comes to fret size. Most players however will develop a preference for size depending on their style. Fret wire can be measured when the size is unknown. Taller frets are often favored by string benders. Their height make it easy to push the string when bending. They also produce a clear note without allot of pressure. The downside is, hard fretters tend to bend the string sharp. You either love these or hate them I think. They have a barely there feel to them. Think fretless wonder. The string really drags against the board when bending. Fret crown widths below .080 is what I would call a skinny fret. These are often seen on vintage guitars, banjos and mandolins. These are good on intonation, but can wear more easily. Wide fret wire of .100-.110 is most often used on electric guitars and basses. These generally wear slower than skinny frets. Excessive wear on wide frets can throw intonation off. Most players can easily spot the grooves worn in frets by string contact. As grooves grow deeper, buzzing may occur because the string now sits lower and contacts the next, higher (less worn) fret. 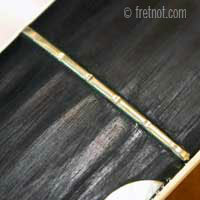 Worn frets can be leveled and dressed only if enough fret height remains to permit filing. 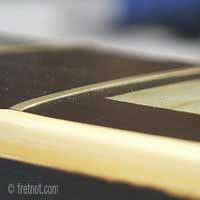 When the edges of frets suddenly become sharp (no recent fret work) it is usually an indication that the fingerboard. When humidity levels drop the fingerboard can shrink enough to leave the edge of the frets now slightly extended. A fret dressing can smooth the sharp edges but the instrument should also be properly humidified to prevent other damage. Some new instruments come with fret wire measuring .055-.060 high. High frets is not for everyone, especially those with a firm fretting technique which is likely to cause notes to go sharp. Frets can be filed to reduce their overall height. Not all wear appears as grooves in the fret. 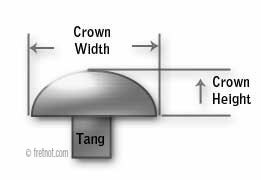 Many times the wear is evident by the lack of roundness to the crown. String bending acts like a file continually filing away at the crown of the fret. In an attempt to correct height issues frets can also be filed too low, when they should have been replaced. The fret's tang can loose it's grip on the fingerboard and rise up. When this happens, the note prior to the lifted fret will normally buzz against this high fret. 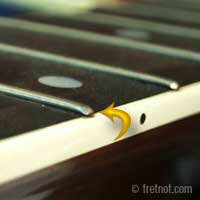 Loose frets can be secured and leveled when height permits. If many are spotted refretting is usually necessary to address the cause of the problem. On instruments with bound fingerboards, shrinking of the binding can produce a gap large enough to catch the treble E string when pulling it over the edge. If only a few our present I will fill the gap to eliminate the problem. If the binding shrinkage has introduced gaps at every fret, the board should be re-radiused to eliminate all gaps and re-fretted. Fret wire is available in numerous sizes, here are a few of the most popular. You may notice some wires have identical fret crown height and width but vary in fret tang size to allow for various fretboard slot size/wear.